According to a study of the American Psychological Association, 38% of people report an increase in stress during the holiday season. This increase can be caused by a lack of money or time, as well as dealing with the holiday hype and commercialism. In another study by the APA, 56% of people find their workplace is more stressful than their home during the holiday season. Reasons vary between lack of satisfaction, heavy workloads, and no opportunity for advancement. 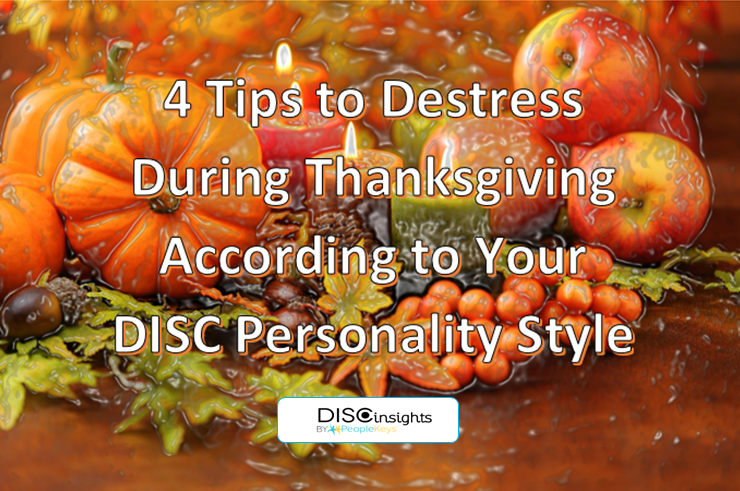 With Thanksgiving approaching, it's time to de-stress and enjoy your holiday office environment as well as your family's Thanksgiving dinner with these tips based upon your DISC Style. By utilizing the DISC Personality System, you can find what role is best for your style at your holiday parties and ways to make events less stressful. According to Professor Marston's DISC theory, people have 4 main personality traits: Dominance, Influence, Steadiness, and Compliance. If you're not sure what your style is, you can take the DISC Personality System Assessment by PeopleKeys, which gives you profound insight into your behavior and will enable you to enhance communication, understand yourself better, and be more productive. You can also take an extra step and utilize any of the elements of our 3D Report, which will also give you a chance to discover your team role style and your values style. Your high D personality makes it instinctual for you to take command of the kitchen and either cook everything or manage the cooking for everyone else. You're a born leader and want to be in charge. You not only want to decide the meal but also the desert and to dole out tasks to other family members. Take this Thanksgiving to ease off the reins, allow others to do their part, and take a smaller role in the kitchen with preparing just one simple dish! It's okay to curl up on the couch and watch the game for a bit or take a moment to relax and focus on what you're thankful for. As the social butterfly in the office, you're always up for sending out invitations to every social event of the season. You're in charge of the guest list and making sure everyone sends in their RSVPs. Make sure, however, that you plan all important details and don't forget to make a grocery shopping list. It will be a lot less stressful if you have a plan. Don't forget to take time off from your phone also, so you can enjoy some intimate family time. Don't worry - Facebook will be here when you get back! You're known for being dependable. You are always up for listening to family and friends who need to vent, and you tend to put your own needs on the back burner. You are always trying to support everyone, fix problems, and over commit yourself. Burnt pie? You'll run to the store. Too many potatoes? You'll peel them in no time. But make sure to take time to check in on yourself. You don't want to burn yourself out, even if that means a slightly charred turkey dinner. You always focus in on the details and this holiday is no exception. You're the perfect person to organize who is bringing or making each dish and grocery shopping for the best bargains. You have a talent for crunching numbers and focusing on quality. However, don't get bent out of shape if not everything goes according to plan. You may be surprised by how much fun can be found, even in chaos! With these tips and tricks according to your style, we hope you have a great feast with family and great parties with colleagues, and hopefully you can create a stress-free holiday season for yourself.